Lightweight speakers with heavy-duty components. The SPGN12 two-way loudspeakers weigh less than 25 pounds and pack a ton of punch. The SPGN12 features 1200-watt peak power capacity. They are designed with a 1.35-inch pure titanium high-frequency compression driver, and a 12" low frequency transducer with a 2.5" high temperature aluminum voice coil to handle extreme power. Precision-designed drivers, crossovers and cabinet for maximum clarity. The crossover in the SPGN12 utilizes a Rockville's unique constant impedance circuit design. With equalization based on unique driver parameters and cabinet design properties the SPG speakers sound dispersion patterns match both the compression horn and woofers. This provides crystal clear natural sound at all volume levels including peak sound levels. You will experience exacting reproduction of bass, critical midrange and high frequencies for superb clarity. 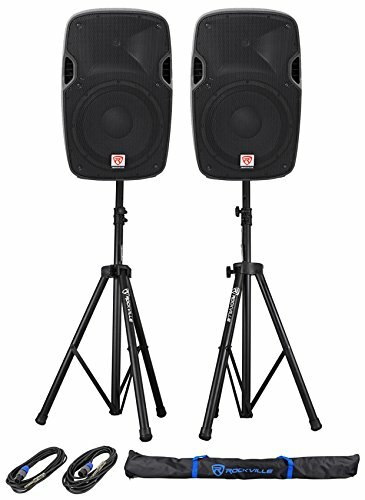 Package Includes: (2) Rockville SPGN128 12" Passive 2400W DJ PA Speakers ABS Lightweight Cabinet 8 Ohm. (1) Pair of Rockville Tripod Speaker/Lighting Stands+(2) 20 Foot 1/4"-SpeakOn Cables. Rockville SPGN128 12" Passive 1200 Watt 8 Ohm Lightweight DJ PA ABS Cabinet Speaker. Power Handling: 300 Watts RMS / 600 Watts Program Power / 1200 Watts Peak. High power long-throw 12'' woofer with 2.5" aluminum voice coil provides incredibly deep bass and acoustic power. High-power 2-way pro sound reinforcement speaker system for live sound and play back applications. Compact and light weight system delivers distortion free sound even at extreme SPL. State-of-the-art 1.35'' Japanese made pure titanium-diaphragm compression driver for crystal clear high-frequency reproduction. Twist-Lock speakon input and output connections. Stage floor or stand mounting with 35-mm pole socket. Ultra-wide dispersion, 40° large-format horizontal wave guide horn molded directly into the cabinet . Versatile trapezoidal enclosure design allows different positioning. Tilts on its side for use as a floor monitor . Ergonomically shaped handle for easy carrying and setup. High-quality components and exceptionally rugged high impact ABS construction. Impedance: 8 Ohms. Frequency Response: 40Hz-20KHz. Maximum SPL @1w/1m: 125dB peak / 122dB continuous . Adjustable Height. Steel Construction. Black Color. Weight capacity: 100 LBS . Adjustable Height Range: 47.25-78.75 inches. Base spread: 15-40 inches. Tube Diameter: 1.5 - 1.37 inch . Leg Diameter: 1.37 inche. Includes (2) 20 foot 1/4" to Speakon NL-4 speaker cables. Includes (1) Carry Bag.